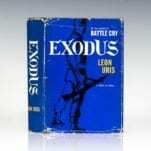 Exodus: A Novel of Israel. First edition of Uris’ magnum opus. Octavo, original half cloth, cartographic endpapers. Near fine in a very good dust jacket with some rubbing and wear to the extremities. Jacket design by Sydney Butchkes Harlan Krakowitz. 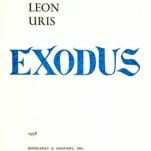 Exodus is an international publishing phenomenon--the towering novel of the twentieth century's most dramatic geopolitical event. Leon Uris magnificently portrays the birth of a new nation in the midst of enemies--the beginning of an earthshaking struggle for power. "Passionate summary of the inhuman treatment of the Jewish people in Europe, of the exodus in the nineteenth and twentieth centuries to Palestine, and of the triumphant founding of the new Israel" (The New York Times). 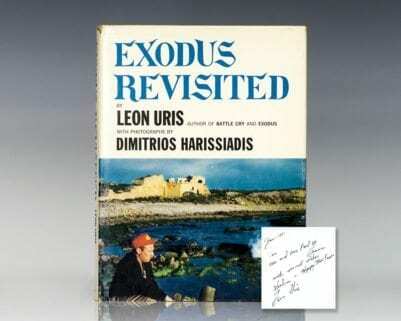 Uris, Leon; Photographs by Dimitrios Harissiadis . Garden City, NY: Doubleday & Company, Inc, 1960. First edition of this monograph of photographs of Uris’ visit to Israel. Quarto, original cloth, illustrated throughout. Boldly signed by Leon Uris on the front free endpaper. Near fine in a very good dust jacket with light rubbing and wear. Jacket design by Sydney Butchkes. Project coordination by Ilan Hartuv. First edition of the author’s magnum opus. Octavo, original half cloth, cartographic endpapers. 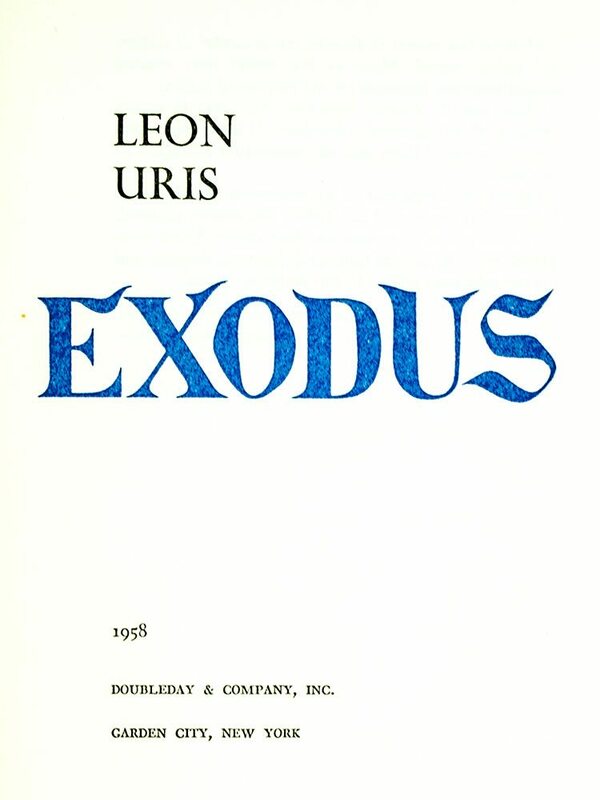 Boldly signed by Leon Uris on the half-title page. Some offsetting and name to the half-title page, near fine in a near fine jacket with some rubbing to the extremities. Jacket design by Sydney Butchkes. Jacket drawing by Harlan Krakowitz. Signed first editions of Exodus are uncommon. First edition of this monograph of photographs of Uris’ visit to Israel. Quarto, original cloth, illustrated throughout. 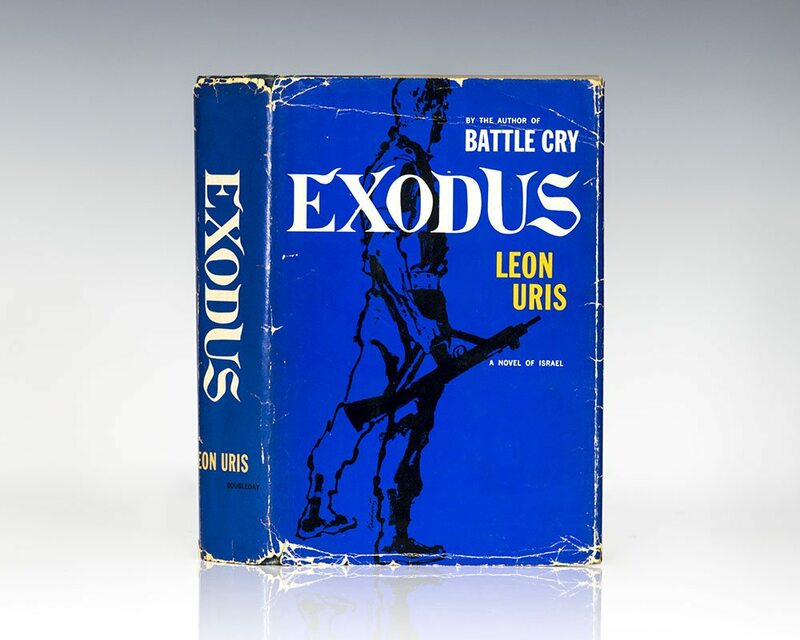 Presentation copy, warmly inscribed by the author on the front free endpaper in the year of publication, “Jan- 1960 For Mr. and Mrs. Paul W. Learner with warmest wishes Shalom- Happy New York Leon Uris.” Near fine in a very good dust jacket with light rubbing and wear. Jacket design by Sydney Butchkes. Project coordination by Ilan Hartuv.